The moon is sort of a cliché, right? Even contemporary poets tend to avoid it. But say, for instance, I become lost one night, does the moon suddenly become more relevant? Or can’t I simply use my smartphone as a flashlight until I stumble my way back to the fluorescent parking lot that contains my car and GPS? 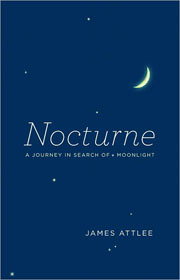 In his collection of essays Nocturne: A Journey in Search of Moonlight, James Attlee challenges us to reexamine our relationship to the night sky for the sake of both our sense of mystery and our planet’s health. “Some books begin as a random accumulation of ideas, spinning like the debris of rock fragments, ice and gases that follow an impact in space. Gradually, as more material is added, they attain mass and attract more objects to themselves, eventually, as their inner cores cool, achieving solidity. It is thought that this is how the moon was formed.” Indeed this is the way the collection reads, beginning in an English dentist’s chair and travelling from points such as the rim of Mount Vesuvius to a moon-viewing festival in Kyoto to neon-soaked Las Vegas. Attlee provides us with a collage of fascinations. He creates simultaneously a cubist portrait of the moon and of the moon reflecting its audience. Here is the moon beneath which Li Po drank his wine and wrote his poems. Here is the moon toward which Galileo focused his telescopes, the same moon that terrified Mussolini, the same moon Futurist megalomaniac Marinetti wanted to see obliterated with gaslight. Attlee guides us not only through space but also through time, from earliest mythology to today’s flavor of moon worship. In “From Vegas to Vega: American Moon,” he describes his experience in the Arizona desert where any one of us could, as he attempted to, book time on a platform surrounded by parabolic mirrors to bask in concentrated moonlight. Ultimately, Attlee’s moon reflects our species objectively: Romantic painter, fascist, poet, distanced family member, fallen soldier, and scientist alike all claim some portion of night. 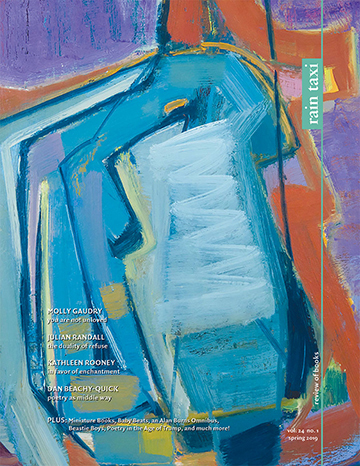 However, taking to heart the number of goddesses associated with the moon who have been worshipped around the globe, the almost complete lack of female observers given voice in the collection is highly noticeable, though this reads as less of an omission on the author’s part than as an illuminating silence. That absence is another facet of the same cultures that Attlee turns a critical eye toward for exhausting the extensive natural resources necessary to wipe out night with technology. This entry was posted in Uncategorized and tagged winter 2011 on November 8, 2013 by admin.